BANGI, 18 Dec 2013 – Dato’ Mahmud Mohd Nor, the husband of Prof Tan Sri Dato’ Seri Dr Sharifah Hapsah Syed Hasan Shahabudin, Vice Chancellor of University Kebangsaan Malaysia (UKM), sang a beautiful rendition of Frank Sinatra’s “My Way”, for his wife during a mini concert in her honour last night. 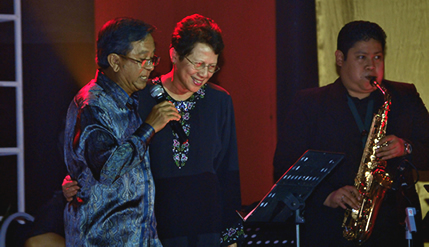 Dato’ Mahmud had changed the lyrics to suit the Vice Chancellor and sang it directly to her. Near the end of the song Prof Sharifah Hapsah joined her husband on stage and hugged him after he finished. The mini concert entitled “Konsert Kasih” was organised by the UKM Cultural Centre in celebration of the Vice Chancellor and in appreciation of her work at UKM for the past seven years. Prof Sharifah Hapsah will step down as Vice Chancellor and retire in January 2014. The mini concert was held at the Arts Theatre in UKM with the Deputy Vice Chancellors in attendance, Prof Datuk Dr Noor Azlan Ghazali, of the Academic and International Affairs; Prof. Dato’ Ir. Dr.Othman A. Karim of the Students and Alumni and Prof Dato’ Dr Rahmah Mohamed of Research and Innovation Affairs. Many UKM staff were also there to share in the celebration of the career of an impressive and outstanding woman. Dr Rafie Hj Mohamad, the head of the Cultural centre, gave a short speech in which he thanked the Vice Chancellor for having always supported student activities that revolve around artistic culture and the performing arts. He hoped that Tan Sri Dr.Sharifah would be entertained and thrilled by the performances that they had selected especially for her. Among those performing were the UKM Choir which had recently won third place at the MAKUM Choir Festival 2013, and sang a medley of songs from the group Black Dog Bone. Students Fadli Haris and Raes sang the song “Tekad”. The duo are actually a part of the UKM Nasyid Group named Ensemble, which had recently won the “Special Jury Award” at the MAKUM Nasyid Festival 2013. Surprise performances were made by the members of the UKM staff including, Lieutenant Colonel Jury Tasripan, with his song “Widuri”; Dato’ Laily Din with her song “Namamu Di Bibirku” and Deputy Vice Chancellor Prof Dato’ Ir Dr Othman A Karim, with his rendition of “Biarlah Bulan Bicara Sendiri”. The evening ended with the presentation of special gifts to both Prof Sharifah and Dato’ Mahmud, before a group photo session with all of the staff in the audience.